← Thanksgiving in Portland and Dinner at The Farm Cafe! 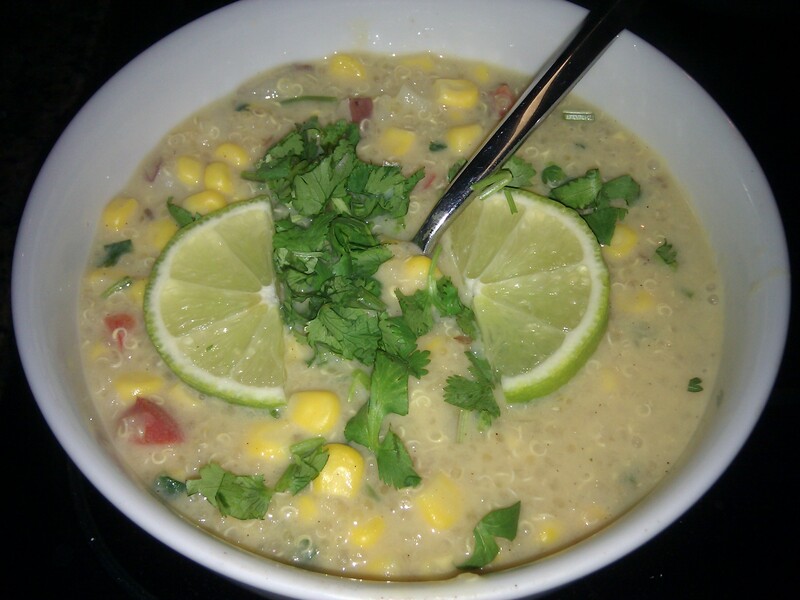 Creamy, Healthy Corn and Quinoa Chowder! Last night, in keeping with the weather theme of this whole week, it was FREEZING. Well, freezing for California which is still pretty cold (like 30-40 degrees)! So of course, I decided that soup would be the perfect thing to make for dinner and warm all of us up. 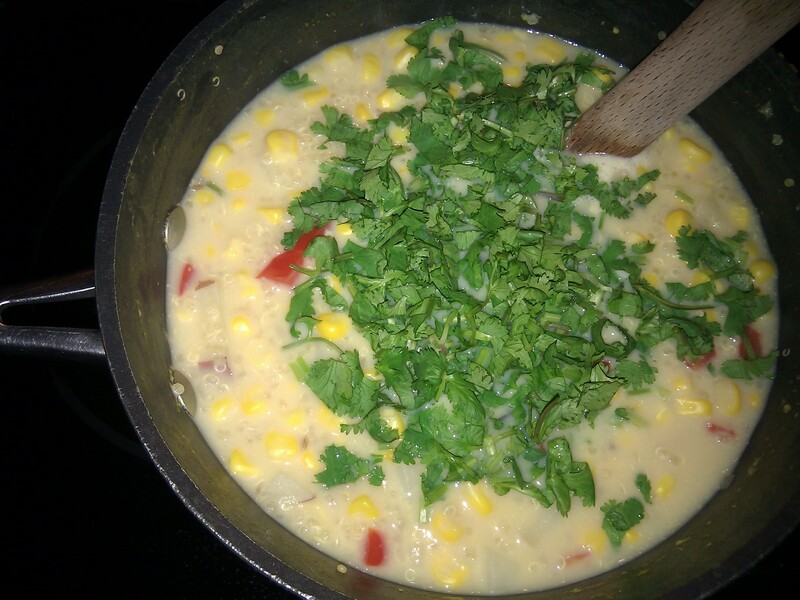 Corn Chowder is something I’ve always enjoyed – but I never eat more than 2 bites of it because the traditional recipe is made with tons of butter and cream / whole milk – so the soup ends up being like 50% fat and tons of calories. Then I found this recipe on Vegetarian Times and I was super excited to try it because of all the healthy substitutions! The recipe and my modifications are below – enjoy! Salt & Pepper to taste – this is a MUST! Toast quinoa and cumin seeds in pot over medium-high heat, 3 to 4 minutes, or until golden and fragrant, stirring constantly. Transfer to bowl. Heat oil in pot; add corn, potato and shallots. Sauté 5 minutes, or until shallots are translucent. Add broth and soymilk, and bring to a boil. 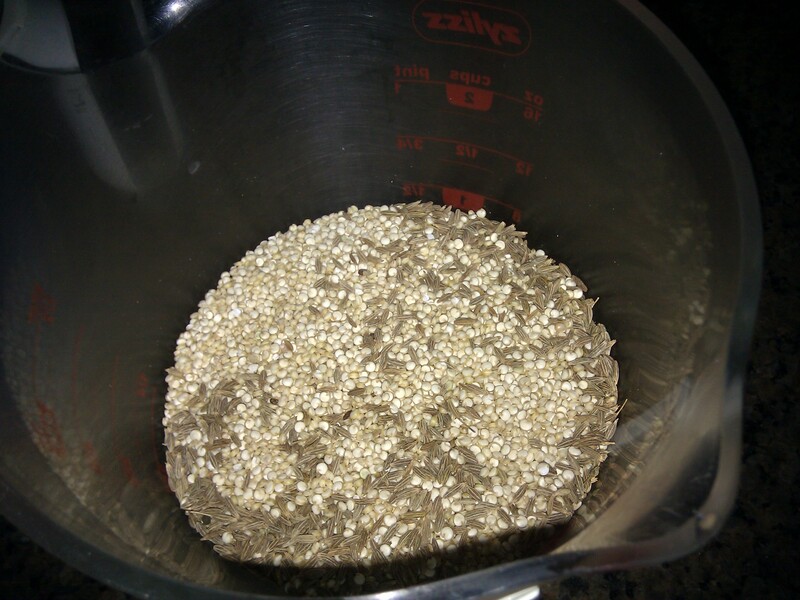 Stir in quinoa mixture. Reduce heat to medium-low, cover and simmer 10 minutes. Stir in bell pepper, cover and simmer 5 minutes, or until quinoa and vegetables are tender. Remove from heat; stir in chopped cilantro. Season to taste with salt and pepper. Ladle into soup bowls, and garnish with cilantro sprigs and lime wedges. I served it with toasted pita wedges which were fun to use as little dippers in the soup! The Nutritionals are also great: The recipe makes 6 servings; and one HUGE serving only has ~250 calories, 8g protein and 5g fiber! Can NOT wait to make this! Thank you for sharing! I am absolutely trying this out! Thanks for a great recipe! Yummy! I wonder how some navy beans would do in the mix? that sounds like a delicious chowder!! I have my girls eating quinoa on a regular basis now, I will have to try your recipe! This looks really creamy and delicious. Can you taste the soy milk in the soup? I’ve been making a few quinoa soups and I really like it since quinoa is so much healthier than pasta. So, the amazing thing is – you can’t taste the soy milk in the soup at ALL! Just make sure you get the unsweetened, unflavored one. It just gives the soup an amazing, creamy texture without adding all of the fat/etc of regular cream. And totally agree with you about quinoa – its such a great substitute! I’m glad to have found your blog via LinkedIn. I’ve been looking for a good quinoa recipe and this one looks delish — can’t wait to try it out, especially since my husband, who is a big meat-eater (but who I’ve gotten to eat more meatless meals — triumph! :-)), loves corn chowder. This quinoa chowder looks absolutely amazing, it’s so creamy and I’m sure very yummy too. I’ll definitely give this recipe a go. Thanks for your comment! Let me know how it turns out for you. 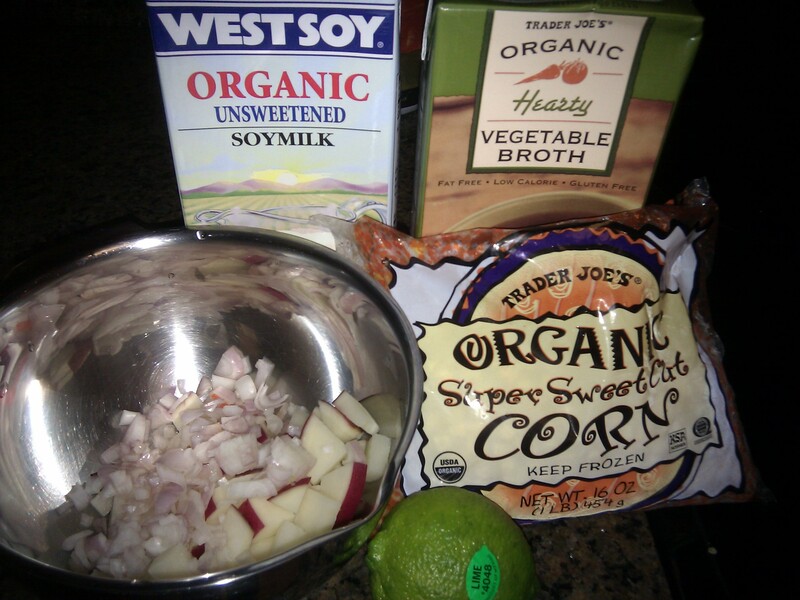 I’m not a huge fan of soy milk either – but you can’t even taste this one in the soup (I got it from Trader Joe’s). Love your blog btw – I’m always looking for more recipes to make with quinoa!